Botanists tell us that the fall leaf colors, those yellows, oranges, and reds, are in the leaves from the beginning but are masked by the green of chlorophyll for the duration of the growing season. 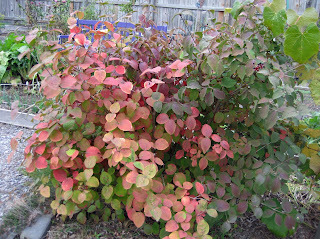 But as the days get shorter and colder, the plant makes less chlorophyll allowing the other colors to shine through. It seems in my own garden that it has only been in the past few days that we’ve started to see those other colors. 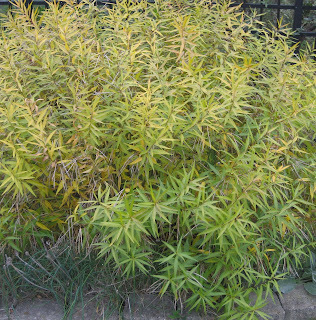 This is a perennial that dies down to the ground in the fall once it provides a nice spot of yellow in the perennial border. There are the oranges, pinks, and more of Viburnum carlesii, Korean Spice Viburnum. If you want a good, smaller Viburnum, this is the one to get. 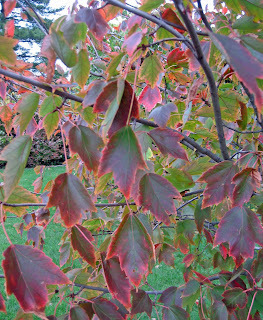 And there are the reds of the Acer rubrum, Red Maple. This is either ‘October Glory’ or maybe ‘Autumn Blaze’. I have another one that is either ‘Autumn Blaze’ or ‘October Glory’. I call them both ‘Autumn Blaze or October Glory’, all one name, because I forgot which one I planted in the front and which one in the back. We see other things in our gardens in the fall besides what colors were hidden underneath all that chlorophyll. We see the true form of the trees and the branching that was hidden beneath the leaves. As we cut back perennials and remove spent annuals, we see again the structure of the garden. We notice the size of the flower beds, the curves of the paths, the empty spaces. We see potential and opportunities in open spaces and cleaned up flower beds. Seeing all this bare garden in the fall gives us an opportunity to take a good, long look at the state of it all, and think about what we want to change. Then we have all winter to figure out what that change should be. It's hard to beat a Maple for great autumn color. You could call the Maples "October Blaze." And really, I swear I'd never suspect you of planting in alphabetical order. I bet you don't even have your canned foods & spices in alphabetical order. All that "open space" is deceptive. Every winter & spring I think I have more available planting space than I actually have, as some plants, such as Hostas, take up much more space when fully leafed out than they do as dormant nubs. I have the same ASEA (available space exaggeration affliction) as MMD...things die back and I get excited about planting something new and then it all comes back. I like when the leaves fall and you can see how much a tree has branched out or filled in since the spring. I take special delight in my three redbuds - I grew them from pups. The Japanese maples in my woodland look very nice and the rusty blackhaws are coloring up, too. I like the winter form of several trees and shrubs in the garden. But since we have no snow cover all the bare spots in the garden jump out at me all winter long! I enjoyed reading about your fall colors and observations. I have been enjoying my amsonias, too. I didn't know that about the chlorophyl. Thanks for the information. Another thing I see, at least, is all the vole and chipmunk holes that were hidden by foliage. One good reason to cut everything down, so they don't have as many places to hide! I'll wager you are some sort of librarian Carol....IT specialist, I am sure of it with the way you catalog trees. Too funny! My carlesii is over twelve feet tall. You might have to prune in the future. I am totally embracing autumn! Wonderful color, Carol, and a great addition to Dave's Fall Color Project! Beautiful colors on that viburnum. My Amsonia is new this year and not as thick as yours, though the spikes are as tall, I think. I don't know what to expect out of it as far as winter goes and next spring. It's just now starting to turn yellow, but mostly green yet.